T-lymphocytes (a type of white blood cell) are a part of the body’s defence system, and test subjects who consumed cranberries for a period of 10 weeks showed nearly five times higher differentiation rates than those in the control group. The faster differentiation of T-lymphocytes leads to a more efficient curbing of infections in the body. In the group consuming cranberries, there were considerably fewer cases of upper respiratory tract infection symptoms than in the control group. According to the study, this could be explained by the fact that the T-cells activated by cranberries are positioned on the epithelium on the surface of mucous membranes, thus constituting the first line of defence. Nantz MP, Rowe CA, Muller C, Creasy R, Colee J, Khoo C, Percival SS1. J. Consumption of cranberry polyphenols enhances human γδ-T cell proliferation and reduces the number of symptoms associated with colds and influenza: a randomized, placebo-controlled intervention study. Nutr J. 2013 Dec 13;12:161. doi: 10.1186/1475-2891-12-161. The latest research results have shown that cranberries influence the functionality of intestinal microflora and have an effect on cardiometabolic risk factors. 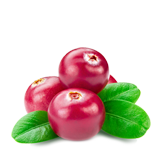 Cranberries are proven to have antimicrobial properties, i.e. the capacity to destroy microbes and prevent their growth and multiplication. For example, the proanthocyanidins in cranberries prevent the multiplication of external populations of E.coli in the intestines which would otherwise cause diseases, thus preventing intestinal and urinary tract infections. Cranberries have also been shown to prevent the permeability of the intestinal wall, which has been proven to be related to the onset of autoimmune disorders, such as diabetes and inflammatory intestinal diseases. According to the study results, cranberries also seem to have positive effects on cardiovascular health, such as the amount of blood lipids, blood pressure, sugar metabolism, inflammation marker as well as oxidative stress. Blumberg JB1, Basu A2, Krueger CG3, Lila MA4, Neto CC5, Novotny JA6, Reed JD3, Rodriguez-Mateos A7, Toner CD8. J. Impact of Cranberries on Gut Microbiota and Cardiometabolic Health: Proceedings of the Cranberry Health Research Conference 2015. Adv Nutr. 2016 Jul 15;7(4):759S-70S. doi: 10.3945/an.116.012583. Print 2016 Jul. According to the study carried out on rowers, those athletes who had consumed cranberries for a period of six weeks had clearly increased their blood’s antioxidant capacity compared to the control group who did not consume cranberries. Antioxidants are compounds that prevent oxidization caused by free radicals. Modern science indicates that antioxidants could prevent several chronic illnesses, such as the onset of cardiovascular diseases and cancer. Skarpańska-Stejnborn A1, Basta P2, Trzeciak J3, Michalska A1, Kafkas ME4, Woitas-Ślubowska D5. J. Effects of cranberry (Vaccinum macrocarpon) supplementation on iron status and inflammatory markers in rowers. J Int Soc Sports Nutr. 2017 Feb 28;14:7. doi: 10.1186/s12970-017-0165-z. eCollection 2017. 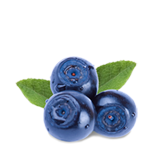 The study researched the effect of blueberries on the risk factors of cardiovascular diseases. Test subjects consumed frozen blueberries three times a week, for a period of six weeks. Then, the test subjects went through various laboratory testing for blood values that have been shown to have a connection with cardiovascular diseases. After a six-week research period, subjects were found to have lower total blood cholesterol and lower blood sugar values. The subjects were also found to have higher levels of good cholesterol, i.e. HDL. Habanova M1, Saraiva JA2, Haban M3, Schwarzova M4, Chlebo P5, Predna L6, Gažo J7, Wyka J8. 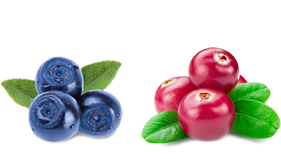 J. Intake of bilberries (Vaccinium myrtillus L.) reduced risk factors for cardiovascular disease by inducing favorable changes in lipoprotein profiles. Nutr Res. 2016 Dec;36(12):1415-1422. doi: 10.1016/j.nutres.2016.11.010. Epub 2016 Nov 23. Nitric oxides function as secondary neurotransmitters in the brain, and they have been connected to studying, aggression and depression, for example. This study researched the role of nitric oxides in the prevention of depression caused by unpredictable mild stress. According to the study, blueberries influence nitric oxide levels in the brain, thereby alleviating stress. Kumar B1, Arora V, Kuhad A, Chopra K. J. Vaccinium myrtillus ameliorates unpredictable chronic mild stress induced depression: possible involvement of nitric oxide pathway. Phytother Res. 2012 Apr;26(4):488-97. doi: 10.1002/ptr.3584. Epub 2011 Aug 26. Type II diabetes has been clearly associated with an increased risk of cardiovascular diseases. The goal of the study was to find out whether blueberries would prevent the onset of diabetes. Test subjects with diabetes consumed 2 g of ground blueberries daily for a period of 4 weeks. Their bloodwork was tested in the lab before the beginning of the study, at the two-week point, and during the last week of the study. Blood values were compared to control groups of diabetics: in one group, the test subjects used a medication traditionally used for the treatment of diabetes, while the other group was not medicated at all. For those people who consumed blueberries every day, a clear drop in the blood sugar levels was measured compared to the control group. In other words, blueberries were more efficient for lowering blood sugar levels than a medication commonly used for type II diabetes. Blueberries released more insulin, lowered the overall cholesterol level in the blood, as well as reducing the concentration of harmful lipids, LDL and triglycerides, in the blood. On the other hand, in the group who only used diabetes medication, no change was observed in insulin secretion, nor an effect on the blood cholesterol levels. Asgary S1, RafieianKopaei M2, Sahebkar A3, Shamsi F1, Goli-malekabadi N1. J. Anti-hyperglycemic and anti-hyperlipidemic effects of Vaccinium myrtillus fruit in experimentally induced diabetes (antidiabetic effect of Vaccinium myrtillus fruit). J Sci Food Agric. 2016 Feb;96(3):764-8. doi: 10.1002/jsfa.7144. Epub 2015 Mar 19. Unlike for bacterial diseases, no good medication exists for viral diseases. Indeed, the goal of the study was to find out whether blueberries, cranberries, raspberries and strawberries can prevent the multiplication of viruses. The study used the most common viruses that cause infections in people, such as a particular influence type A virus as well as the RS virus that causes upper respiratory tract infections. According to the study, the berries were capable of preventing the multiplication of viruses and thereby prevent infections. Nikolaeva-Glomb L, Mukova L, Nikolova N, Badjakov I, Dincheva I, Kondakova V, Doumanova L, Galabov AS. J. In vitro antiviral activity of a series of wild berry fruit extracts against representatives of Picorna-, Orthomyxo- and Paramyxoviridae. Nat Prod Commun. 2014 Jan;9(1):51-4. Modern research has shown that intestinal microflora has an effect on a person becoming overweight and developing a low-grade inflammation as a result of the excess weight. According to the study, lingonberries have been shown to prevent diet-related excess weight as well as low-grade infection by their impact on the intestinal microflora. Heyman-Lindén L1, Kotowska D2, Sand E3, Bjursell M4, Plaza M5, Turner C5, Holm C2, Fåk F6, Berger K2. J. Lingonberries alter the gut microbiota and prevent low-grade inflammation in high-fat diet fed mice. Food Nutr Res. 2016 Apr 27;60:29993. doi: 10.3402/fnr.v60.29993. eCollection 2016. Resveratrol is a phenol compound which is particularly prevalent in lingonberries. Lingonberries also have a reducing effect on oxidization and inflammation, and they also have antimicrobial properties. Excessive oxidization causes imbalance in cells, making them susceptible for the onset of cancer and coronary artery disease, for example. Resveratrol was given daily for type II diabetics for a period of six months. After six months of monitoring, diabetic test subjects who had been using a resveratrol supplement showed higher levels of decreased weight, systolic blood pressure, the overall blood cholesterol and triglyceride content as well as fasting blood levels compared to those diabetic test subjects who were not given resveratrol. Kumar BJ, Joghee NM. Resveratrol supplementation in patients with type 2 diabetes mellitus: A prospective, open label, randomized controlled trial. Int Res J Pharm 2013;4(8):245-249. Wang B, Sun J, Ma Y, Wu G, Tian Y, Shi Y, Le G: Resveratrol preserves mitochondrial function, stimulates mitochondrial biogenesis and attenuates oxidative stress in regulatory T cells of mice fed a high-fat diet. J Food Sci 2014;79(9):H1823-H1831. 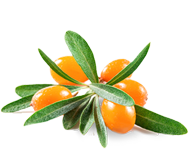 Sea buckthorn has several properties that protect the body against cardiovascular diseases. For example, sea buckthorn prevents the activation of platelets, thus preventing blockages, it also reduces cholesterol and blood pressure, as well as functioning as an antioxidant. Sea buckthorn also has antibacterial and antiviral properties. Sea buckthorns contain several bioactive ingredients which have great health benefits. These bioactive ingredients in sea buckthorn are, for example: Vitamins A, C and E, unsaturated fatty acids, phenol compounds, flavonoids, plant sterols, all of which have a positive effect on the circulatory system. Olas. Sea buckthorn as a source of important bioactive compounds in cardiovascular diseases. Food Chem Toxicol. 2016 Nov;97:199-204. doi: 10.1016/j.fct.2016.09.008. Epub 2016 Sep 9. Metabolic syndrome, a group of symptoms that are related to metabolism, refers to a condition where a person has several health disorders simultaneously. It is caused by abdominal obesity in those people who are genetically prone to the condition. According to the medical book Duodecim, more than a third of adult Finnish men and more than a quarter of adult Finnish women have metabolic syndrome. Among other things, it is related to a significantly increased risk of artery disease. Dietary habits have a great significance regarding excess weight, and the onset of type II diabetes and atherosclerotic cardiovascular disease. 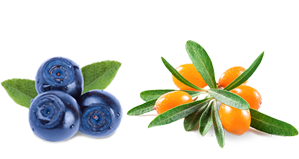 The study compared the effect of blueberries and sea buckthorn regarding the various components of metabolic syndrome in overweight women. The test subjects consumed sea buckthorn and blueberries, for about a month each. As a result of consuming blueberries, waist circumference was observed to have reduced by an average of 1.2 cm, and 1.1 cm as a result of consuming sea buckthorn. Lehtonen HM1, Suomela JP, Tahvonen R, Yang B, Venojärvi M, Viikari J, Kallio H. J. Different berries and berry fractions have various but slightly positive effects on the associated variables of metabolic diseases on overweight and obese women. Eur J Clin Nutr. 2011 Mar;65(3):394-401. doi: 10.1038/ejcn.2010.268. Epub 2011 Jan 12. According to a 2016 article in the journal Molecules, crowberries are an important source of flavonols and anthocyanins. According to the article, these berries are potent antioxidants, and studies have shown that it has antibacterial and antifungal properties. The article also states that these berries reduce the accumulation of lipids or fats, overall cholesterol as well as postprandial hyperglycaemia (an increase in blood sugar levels). Jurikova T1, Mlcek J2, Skrovankova S3, Balla S4, Sochor J5, Baron M6, Sumczynski D7. J. Black Crowberry (Empetrum nigrum L.) Flavonoids and Their Health Promoting Activity. Molecules. 2016 Dec 7;21(12). pii: E1685. Studies have shown that anthocyanins have several health benefits, and these berries are a good source of anthocyanins. In one study, scientists were able to isolate 13 different anthocyanins from crowberries. According to the study, there were 41.1 mg anthocyanins per one gram of crowberry extract: more than in the nine other researched berry species. Of all the berries researched, crowberries were also found to have the highest antioxidant activity. That is why the study suggests that crowberries reduce the risk of the onset of chronical illnesses. Ogawa K1, Sakakibara H, Iwata R, Ishii T, Sato T, Goda T, Shimoi K, Kumazawa S. J. Anthocyanin composition and antioxidant activity of the Crowberry (Empetrum nigrum) and other berries. J Agric Food Chem. 2008 Jun 25;56(12):4457-62. doi: 10.1021/jf800406v. Epub 2008 Jun 4. There have been many studies about the health benefits of blackcurrants. Several studies have shown that blackcurrant is a strong antioxidant, as well as having anti-inflammatory and antimicrobial characteristics. Studies have shown that blackcurrants have a beneficial effect on blood pressure and other risk factors of cardiovascular diseases, the onset of oncological diseases, neurodegenerative diseases, eye diseases, kidney stones and kidney disease caused by diabetes. The health benefits of blackcurrants stem from the bioactive ingredients and compounds they contain, including anthocyanins, flavonoids, phenolic acids and unsaturated fatty acids. Gopalan A1, Reuben SC, Ahmed S, Darvesh AS, Hohmann J, Bishayee A. J.The health benefits of blackcurrants. Food Funct. 2012 Aug;3(8):795-809. doi: 10.1039/c2fo30058c. Epub 2012 Jun 6. 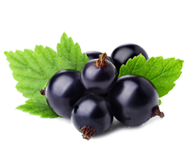 The study researched the blackcurrant’s ability to destroy influenza viruses, with four different influenza strains used in the study. A 10% blackcurrant solution was able to destroy all four influenza strains completely. According to the study, blackcurrants have undisputed disinfecting and antiseptic properties, thus having the undisputed potential to prevent infections caused by the influenza virus. Ikuta K1, Mizuta K, Suzutani T. J. Anti-influenza virus activity of two extracts of the blackcurrant (Ribes nigrum L.) from New Zealand and Poland. Fukushima J Med Sci. 2013;59(1):35-8.